A Mendocino County-based physician, recommends eating—or juicing and then drinking—raw cannabis leaf and bud as a way to achieve megadose therapeutic impact from marijuana without psychoactive effect. But some claims about juicing cannabis are unsubstantiated and misleading. Published in full on Alternet. 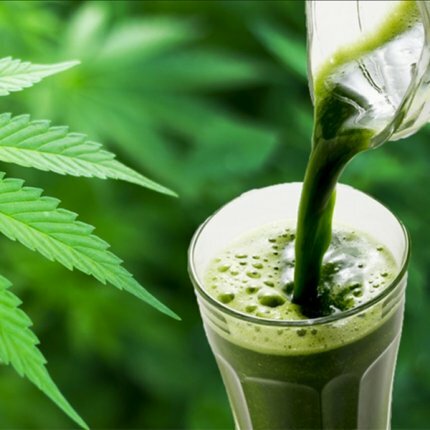 Is Juicing Raw Cannabis the Miracle Health Cure That Some of Its Proponents Believe It to Be? Fact-checking one of the newest trends in administering cannabis for therapeutic use. William Courtney, a Mendicino County-based physician, recommends eating—or juicing and then drinking—raw cannabis leaf and bud as a way to achieve megadose therapeutic impact from marijuana without psychoactive effect. The green plant contains tetrahydrocannabinol (THC) in its acid form, THCA, which is not psychoactive. Leading proponents of ingesting raw cannabis—not just in response to illness but for general health maintenance—include Dr. Courtney’s wife Kristen. For many years, an ailing Kristen Courtney had struggled with systemic lupus. Her prognosis was dismal. But her condition improved dramatically after several weeks of ingesting raw cannabis and drinking the juice of THCA-dominant plants. The plant also contains small amounts of several dozen other cannabinoids (compounds that are unique to marijuana) in their acid form. Convinced that they had discovered a cure for chronic illness, the Courtneys became passionate advocates of juicing. They have inspired a following of true believers in Northern California and beyond. Juicing, the Courtneys argue, is the best way to consume cannabis therapeutically. But many of their claims about the advantages of juicing cannabis are unsubstantiated and misleading.